This morning I was performing a Google search query for identity of the suspect in the Annie Le case. The police have not issued the name of the Yale Lab Technician yet, and I was curious if the suspect's identity had been released to the public by the blogosphere or the Twitter community. I noticed that there are some sites listing the name "Lei Zhang" but appears these sites are posted by Phishers (Wikipedia: those engaging in phishing or the criminally fraudulent process of attempting to acquire sensitive information such as user names, passwords, credit card details), spammers and possibly black hat affiliate marketers. If you see a warning message from your browser: "This site may harm your computer" you should immediately close your browser window and not click on any of the links on that site. Update: Raymond Clark is now being named as the suspect in the Annie Le case. 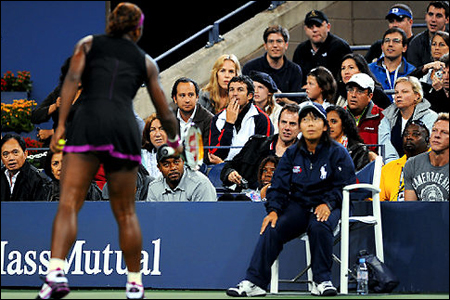 If you want to know the identity of the Asian line judge in the Serena Williams U.S. Open tennis match, her name is Shino. According to the New York Times in an article that was later changed, the identity of the Asian Line Judge or Asian lineswomen is Shino which would probably make her of Japanese ethinicity or heritage. Whenever there is a breaking news story, I personally believe I can find just about anything on the Internet. This morning someone called to ask me if I knew the name of the line judge. I told them I would try and find it, so here it is. Finally, does it really matter what the race, ethnicity or heritage is of the line judge? Why does the media always use the race card?